At the Tokyo Game Show 2014 today, I spent some time with Dengeki Bunko Fighting Climax—a fighter that sports characters from popular anime Sword Art Online, The Devil is a Part Timer, Accel World, Black Bullet, and The Irregular at Magic High School, among others. 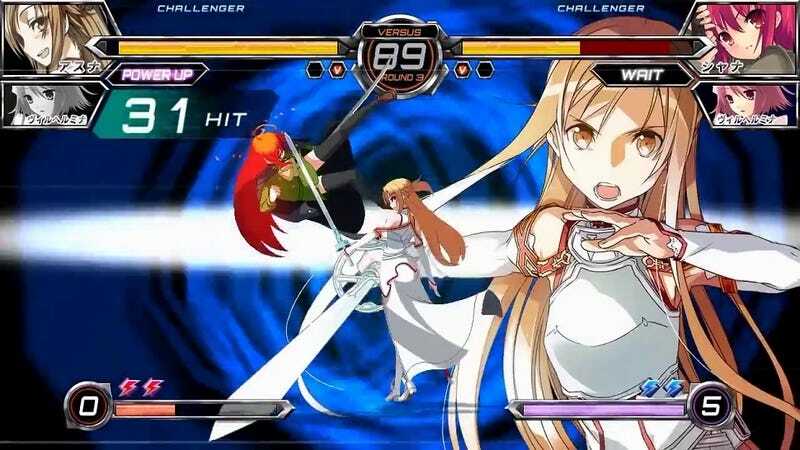 Dengeki Bunko Fighting Climax is a fast 2D fighting game that plays a lot like an Arc System Works title with its auto combo system—a la the Persona 4 Arena games. It also takes a page from the Marvel vs. Capcom series handbook and allows you to summon a support character in battle. But the real draw of this game is not the gameplay, but rather the roster. The game contains a large variety of characters published in Dengeki imprint light novels as either playable fighters or assist characters. And while all the characters' anime voice actors return, the visual design of the characters is based on the the light novel illustrations, not the various anime adaptations—making for an interesting art style shift. Also, as the game is published by Sega, there are more than a few Sega shout outs—like Green Hills Zone being a fighting stage and an anthropomorphic personification of the Dreamcast acting as the game's god. Also, the console version of the game will have Akira Yuki from Virtual Fighter and Selvaria Bles from Valkyria Chronicles as playable characters. Dengeki Bunko Fighting Climax was released in Japanese arcades on March 18, 2014. It will be released in Japan for the PlayStation 3 and PlayStation Vita on November 13, 2014. There is currently no word on an international release.